Elvira Mistress of felinity here. 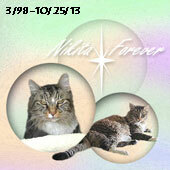 I know you may be wondering why, so soon after Nikita went to Rainbow Bridge. My mood has been a somber one, since Saturday morning, only starting to improve early this morning. Samantha and Clementine, of Life from a Cat's Perspective, were scheduled to host, but are still grieving the loss of Maverick, only slowly moving on. 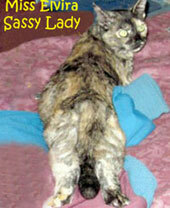 Ritzi's mom, Mog, was going to fill in, then she got sick! I got to thinking...what would Nikita do? He would offer to fill in, of course! So I offered to switch with Mog, who will host next week, instead. Preparing for this has been one of a couple of things I've done to help me get through the this difficult time. 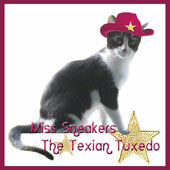 So, this edition is dedicated to my beloved Nikita who hosted so many edtions over the years. So, let's get this show on the road! 1 and 2. 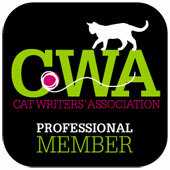 Katya Graymalkin, of Marian Allen's blog, has two great posts, this week. She has developed a sudden crush on male white persian cats, hee, hee! 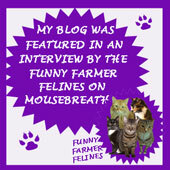 In this post she shares a snippet of an entertaining cat story her human is working on. 3. Over at Create With Joy...Legend, has an informative post on how to keep pets safe in an emergency and discusses the Hill's Disaster Relief Network. What is Patches looking at? Sparkle is up for finding his new Forever Home! 6. 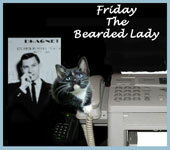 Over at Rascal and Rocco their human, Leah, writes a terrific cat-themed poem! 7. Over at StrangeRanger...Maddie and ivy get all blissful, hee, hee! 9. Over at Mind of Mog, our long time friend does a wonderful tribute to Nikita. Daddy and I thank her and all those who have done similar posts the past few days. 10. As for us, here, Daddy Kiril resumed taking his camera with him when he leaves home, and hitg the jackpot first time back out! Street Seens 72: Black Cats, Orange Cats, Everywhere Cats! Thank you so much for filling in! And still with such a heavy heart you put on a Great Carnival! Wonderful job, Elvira and Kiril. Yes, we agree, that is exactly what Nikita would have done, because that was the wonderful kind of friend he was. Big hugs to you both.